I write this post with a happy heart. This is one of the first things I baked after my 2nd daughter was born. I approached the trusted but packed-up oven with a little trepidation. The goody combination of Chocochips and nuttiness from the dessicated coconut was a heady combination, and trust me when I say that when the the bread / muffins were baked - they were dense and nutty and chocolatey and had the right amount of sweetness - I did a lil jig to confirm that I can indeed bake. This may not qualify for versatile baking. Like I said earlier, I am not a frosting-on-the-cake kind of person - I believe that any sweet bake already has the calories through butter & Sugar, and that we dont need more.Unless, its of course a cheesecake.... ummmm...that I am looking forward to testing out sometime soon :-) Till then I keep counting the calories for myself and the family. This week, being Occassions. And I chose birthday parties & Festivals as the theme, and for the next 8 days starting today, you would see dishes across this theme. 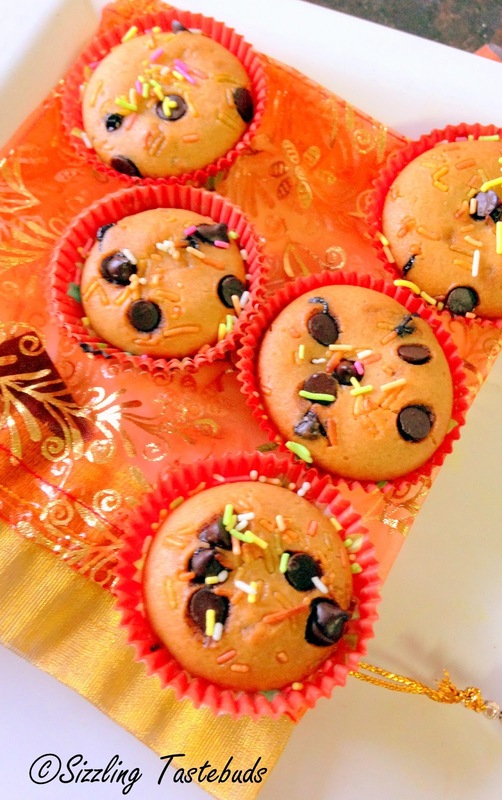 Meanwhile try out this super yummy muffins for you. I am sure your kid will be hooked as was mine. Prep time : 10 mins | Baking Time : 15 to 18 mins per batch | Makes : 12 mini muffin + 200 gm bread. In another bowl, mix the wet ingredients and blend the sugar well till its dissolved well. Preheat the oven at 160 Deg C. Line the Muffin pans with liners or grease lightly. Add the dry ingredients a little at a time to the wet mix and make a thickish flowing batter. Add the chocochips and coconut. Reserve some chocochips for topping. Bake at 160 deg C for 15 - 18 mins or until a skewer inserted into the muffins comes clean. lovely clicks and looks delicious.. So soft and yummy muffin. 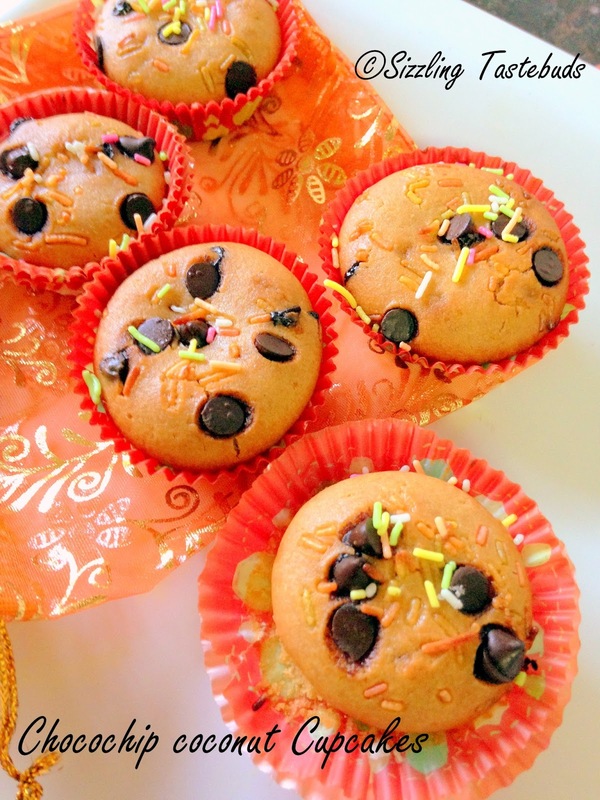 Cute muffins,kids will definitely get hooked to this wonderful,spongy cuties. 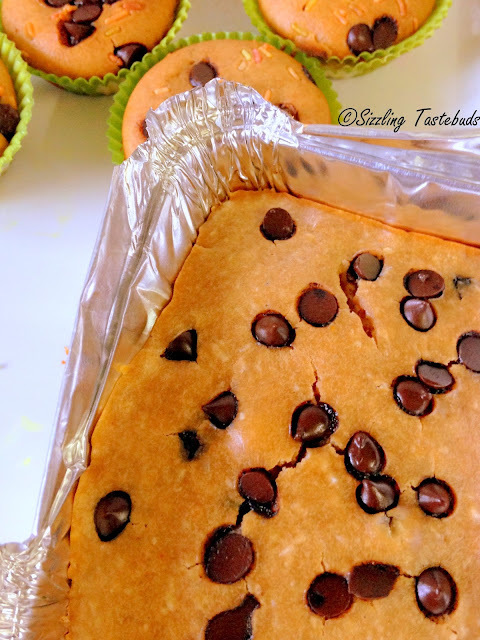 Kalyani seems you are good in maths, 500+recipes with 20+bloggers,wow thats wonderful na.. Such a summerish color of the cup cakes. Very adorable. Beautiful clicks and I am not a frosting person either! Love your bread and muffins they are really awesome. I am sure they got over in no time. 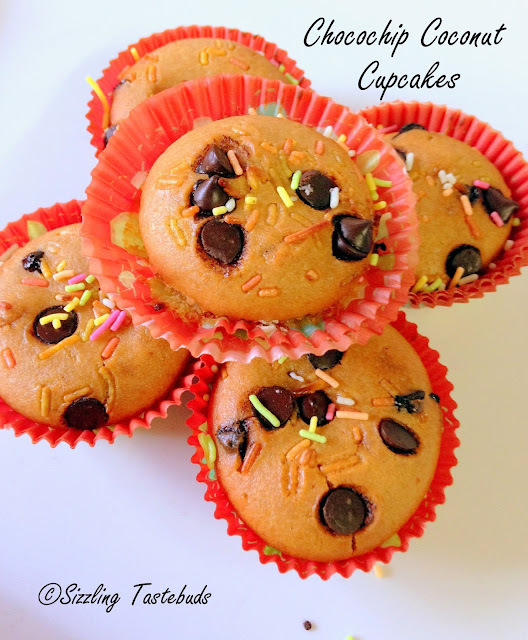 Looks cute and it should taste delicious without the icing :) I love cup cakes and muffins without icing and i am totally in love with this one! I too am averse towards the frosting and try avoiding it totally. As much i hate frosted cakes, lil Angel loves them. She is chnging slowly coz I don't frost cakes :). I am going to try this. Do you think fresh grated coconut will work in this recipe?If so is it the same quantity? Muffins lookd gorgeous.very detailed post.Sure Kalyani,we can talk about this in private.happy to be your follower. Bright and wonderful cupcakes. They look lovely. Both the muffins and bread look yummy. Live those Choco chips on the top. Very inviting. delicious clicks.. those chips look super cute!! !